Okay. Call me a fool. Call me an eternal Jazz optimist. Like this series with the Lakers, in Games 1 and 2 of the 2007 series with the Rockets, the Jazz lose by 9 and 8, respectively. The Jazz also came back to win Games 3 and 4 at home. Similarly, Game 5 is a war, and represents the Jazz's best chance at taking the series, but ultimately the Rockets prevail in a close match. We all know the rest, as the Jazz then go on to win Game 6, and score the surprising upset in Game 7. In that series, the Jazz had a key post player who was underwhelming on the offensive end compared with his regular season numbers. (In the first 5 games of the 2007 series with the Rockets, Okur averages 8.4 ppg compared to a season average of 17.6 ppg. Memo pulls it together for Games 6 and 7 of the 2007 Rockets series to nearly match his season average, scoring 16 and 19, respectively. I hope you are reading this, Carlos Boozer! "Ah", you might say, "but the Rockets of last year do not have what the 2008 Lakers do: Kobe Bryant." And you are right. But this isn't Kobe Bryant MVP. This is Kobe Bryant with a back injury. And, as with most muscular injuries, continuing to play with an injured back will only make it worse. At the most, Kobe's back isn't going to get a lot better, especially when you consider the Jazz's physical nature. 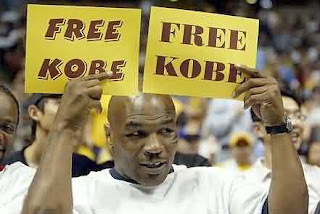 That is not to say that they should cheap shot Kobe, just that the Jazz play hard-nosed physical basketball. During Games 1 and 2 of this series, the Jazz were intimidated by the Staples Center. You could see it on their faces. Game 5 was where they got rid of this intimidation. Other than Williams and Brewer, the Jazz played average, but they were on the verge of victory. If (when) they take care of business this evening, there should be very little white in the eyes of the Utah Jazz when they tipoff for Game 7 at the Staples Center. I could enumerate the reasons, but we all know them. He doesn't deserve to win another NBA title.